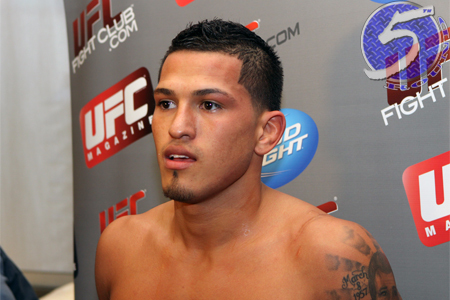 Although Anthony Pettis (Pictured) and Donald Cerrone received third-to-top billing in Saturday’s “UFC on FOX 6” show, most fans were more anxious to see that lightweight shootout than any other fight on the card. The scrap certainly lived up to the hype, at lest for Pettis. Once again, “Showtime” unleashed some devastating kicks to collect a victory and punch his top contender ticket. His liver strike on Cerrone not only earned him ‘Knockout of the Night’ honors, but also first crack at the winner between reigning UFC 155-pound champ Benson Henderson and Gilbert Melendez. Saturday’s event took place inside United Center in Chicago, Illinois.